The difference between yesterday and May 28, 1998 was that Brent Mayne was due up after Buck Showalter, then managing the Diamondbacks, walked Barry Bonds with the bases loaded and two outs in the bottom of ninth in an 8-6 game. Mayne lined to right on a 3-2 count and Arizona won. Showalter looked like a genius. In yesterday's first game, David Ortiz -- another power-hitting lefthander -- came up with runners at first and second and Manny Ramírez on-deck. Showalter, the Rangers' manager, elected to have righthanded closer Akinori Otsuka pitch to Ortiz rather than load the bases for Ramírez, who had homered in the second inning and has been red hot (.339 with 9 homers, 22 RBIs in his last 17 games). Otsuka got ahead, 0 and 2. The decision looked good until Ortiz sent Fenway into a frenzy, striking a blast into the right-field bleachers for a walk off 5-4 victory. Showalter didn't look as smart. ``No disrespect to Barry Bonds or whoever hits behind him, but when you have Manny Ramírez hitting behind Big Papi, that's someone really special right there. It's hard to pitch to Manny any time in that situation," said Sox right fielder Trot Nixon, who came off the bench to pinch hit for Alex Gonzalez and got the rally started with a single up the middle. There was far less intrigue in the nightcap as David Pauley allowed five runs in the first two innings, setting the stage for 13-6 loss to former friend John Wasdin. The end result of the split is a 1-game lead over the Yankees in the AL East. Sox owners John W. Henry and Tom Werner were so buoyed by Ortiz's heroics they stopped by to revel in the slugger's postgame press conference while the hero munched on a tuna melt. Ortiz claimed he called the home run and that Ramírez had predicted Ortiz would hit one later in the game after Ramírez's second-inning solo shot, his second in as many games. ``I've been fighting all year to get comfortable at the plate," said Ortiz. ``But this game is so crazy that when you think you have it, you've got nothing." After falling behind in the count, Ortiz thought, ``The way things are going right now I really wanted to put a good swing on the ball. Make sure I didn't hit the ball right at somebody. That's what's been happening to me a lot this year . . . the only ball they can't take away from me is the one I hit out of the park I guess. I've been trying to fight back. We have a long way to go and if I shut it down just because this is happening right now . . . my team needs me. If I miss one I just come and try to get the next one." Ortiz, whose last walkoff homer came Sept. 6 against the Angels' Scot Shields, claimed it never crossed his mind that Showalter might not pitch to him. He feels he hasn't given the opposition reason to give him Bonds-like respect. Maybe Ortiz, who collected two more hits in Game 2, showed them yesterday. Otherwise, there were three other issues of note in Game 1. One was the performance of Josh Beckett, who couldn't get out of the sixth, allowing four runs overall, including a two-run homer by Kevin Mench that broke a 2-2 deadlock. Beckett, who remained unbeaten at Fenway, allowed his 17th homer and first at home. Beckett thanked Ortiz for bailing him out, but credit should also go to Manny Delcarmen, who earned his first major league win by allowing just two hits over two innings. 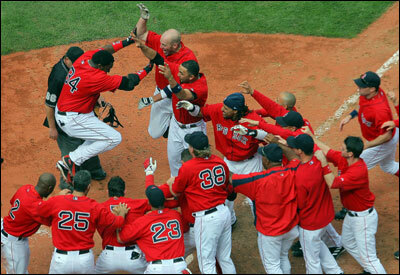 ``I jumped over the [dugout] fence and fell flat on my face," said Delcarmen after he watched Ortiz's laser. ``But it was pretty cool. I've been close a couple of times to getting my first win. When he hit it I was like, `Oh, man!' "
The other notable was a disputed RBI double by Ian Kinsler in the fifth inning that tied the game at 2-2. Third base umpire Paul Schrieber threw his hands up indicating a dead ball on the shot down the line, but as soon as he got the signal from home plate umpire Jim Joyce that it was fair, he reversed the call. Play did not stop as Ramírez retrieved the ball. Red Sox manager Terry Francona argued in vain that the ball should have been dead. Pauley got the nod in Game 2 after Matt Clement was given more time to rest his cramping right biceps. The young righty had been skipped in the rotation for Jon Lester after limiting the Yankees two runs on eight hits in 6 2/3 innings in a 2-1 loss last Tuesday in New York. ``Basically I was staying too fastball dominant," said Pauley, who allowed 12 hits and six earned runs in five innings. ``That was one pitch they were on today. In the later innings I started using my pitches, throwing more curveballs for strikes and keeping them off-balance a little bit better than I was to start off the game." Pauley got them into two batters of the sixth inning before Julian Tavarez took over. The Sox scored four runs in the bottom of the sixth off Wasdin. Nixon, J.T. Snow, Doug Mirabelli, and pinch hitter Kevin Youkilis all knocked in runs to pull to within 6-4, but the Sox bullpen couldn't maintain the status quo. As good as the bullpen was in Game 1 (3 2/3 scoreless innings), it was that bad in Game 2 as Rudy Seanez, who relieved Tavarez, allowed three runs to score as Texas stretched its lead to 9-4. Mike Lowell's RBI double in the seventh cut the deficit to four, but that was as close as the Sox would get as Keith Foulke, despite having decent velocity, blew up in the eighth, allowing three runs on three hits and a wild pitch, and another run in the ninth. ``We were not only within striking distance [at 6-4] but you look down at the end of the bench and you see Manny sitting there with his spikes and his bat ready to hit," said Francona. ``We thought we were coming. You could kind of feel it, but we just couldn't stop them."